Americans are spending more on their pets than ever before, according to estimates in a new report. 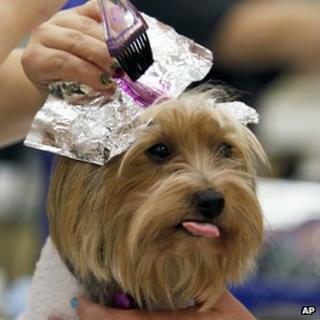 The American Pet Products Association (APPA) says spending on pets in the US passed $50bn (£31.5bn) in 2011. Food and veterinary costs accounted for about 65% of the figure, but the category of "pet services" grew faster than any other, totalling $3.79bn (£2.39bn) in 2011. Pet services includes grooming, boarding, pet hotels, and pet-sitting. Spending on pet services should continue to grow and reach $4.11bn (£2.59bn) by the end of 2012, said APPA President Bob Vetere. "We are seeing a boom in this category as people continue to work and require services such as pet-sitting, boarding and walking to care for their pets at home," Mr Vetere said. Pet insurance is expected to be another growth area, with spending estimated at $450m (£284m) in 2011. A wide range of pet clothes are available from US retailers, from polo shirts to wigs and fancy dress costumes. "People are more interested in pets than ever before but they are taking their time, once they make the commitment, to do it right," San Diego veterinarian Jessica Vogelsang told the Associated Press. The pet services industry is becoming ever more adept at providing pet owners with items to meet their specific needs, Ms Vogelsang says. "We are seeing a lot of puzzle feeders for dogs - not just toys but ones that are geared toward the mental needs of the animal. Then there are bionic toys for destructive chewers, a lot of very niche items." Why do Americans keep dangerous pets?